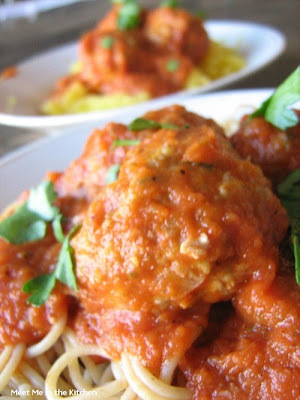 This week's CEiMB recipe, Turkey Meatballs with Quick & Spicy Tomato Sauce and Whole Wheat Spaghetti, was chosen by Amanda over at Oddball Oven Mitt. I really like meatballs (is that wierd, because I don't actually like meat?) Anyway, I was excited about this meal. My 4-year old is always asking me for noodles and red sauce, so she was excited too. 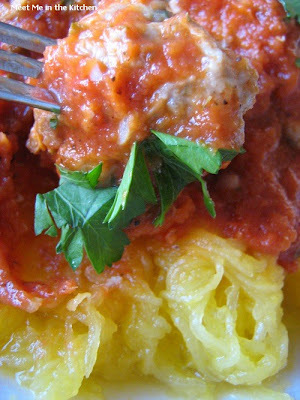 I decided to give everyone a choice and serve cooked spaghetti squash too. 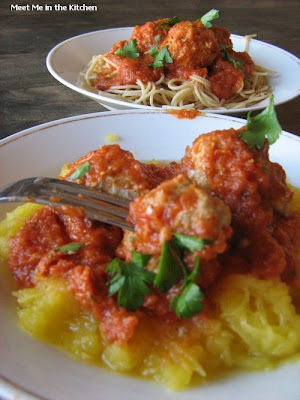 I used whole wheat angel-hair pasta and most everyone wanted some noodles and some squash. I followed the recipe pretty closely. I used 93% lean ground turkey because I think it is better for meatballs than ground turkey breast, which is a bit leaner. 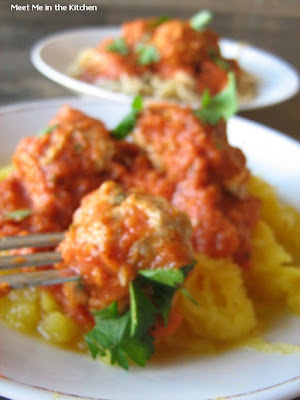 One of the things I did change was that I made the meatballs smaller than Ellie called for. My kids like meatballs and I prefer them to be smaller also, so I got about 28 meatballs and then changed the cooking time accordingly. And I didn't add the sauce and meatballs to the pasta. I just served up everyones plate separately and that left enough sauce and meatballs to be distributed to the pasta and the squash. We really enjoyed this dinner. To see what everyone else thought, check out the Craving Ellie Blogroll! Fill a large stockpot with water and bring to a boil for pasta. 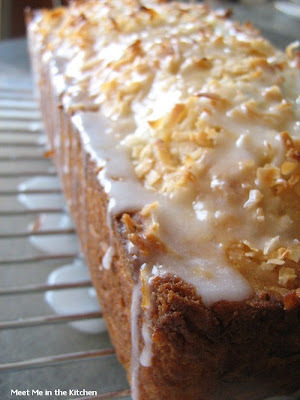 I am convinced that this is the best Banana Bread ever. 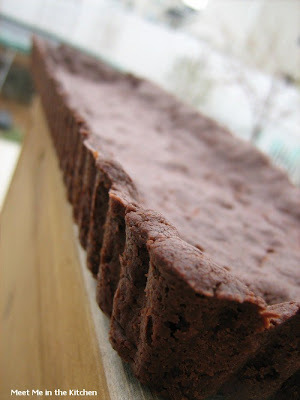 I have been making it for 6 years, ever since I saw it on the cover of Cooking Light Magazine. I have tried lots of other recipes too, because I am always up for trying new things. I have made the Cardamom Banana Bread with Pistachios, the Marbled-Chocolate Banana Bread, the Molasses-Oat Banana Bread, the Orange Banana-Nut Bread, the Classic Banana Bread; not to mention family and friends' recipes too. And they are all really good. But, I always come back to this recipe. It was rated as the best Quick Bread recipe that Cooking Light has ever come out with in their 20th anniversary issue and I wasn't surprised at all when I saw that in print. It makes for a great gift for new or old mothers, new and old neighbors, basically, I would give this bread to anyone, anywhere and they would be glad to get it. 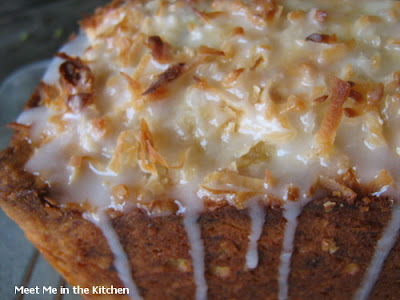 I love the combination of coconut and lime and that is exactly what is going on here. 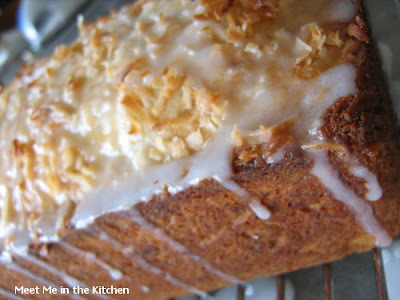 The glaze is delightful, the bread is moist and you can't really ask for anything else in a quick bread recipe. Plus, it is a little bit healthier than some of the other banana bread recipes because it has a little less butter and some plain yogurt added in there. The recipe suggests subbing apple juice for the rum and that is what I always do. 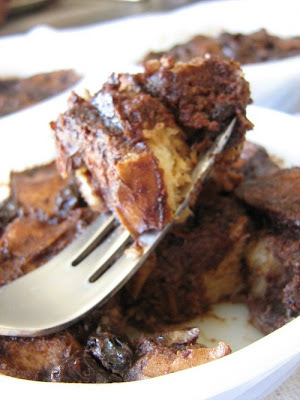 So, next time you have ripe bananas that need to be used, try this recipe and you will be happy you did! The tangy lime glaze cuts the sweetness of the bread. Substitute apple juice for the rum if you prefer. Place granulated sugar and butter in a large bowl; beat with a mixer at medium speed until well blended (about 1 minute). Add the eggs, 1 at a time, beating well after each addition. Add banana, yogurt, rum, and vanilla; beat until blended. Add flour mixture; beat at low speed just until moist. Stir in 1/2 cup coconut. Bake at 350° for 1 hour or until a wooden pick inserted in center comes out clean. Cool 10 minutes in pan on a wire rack; remove from pan. 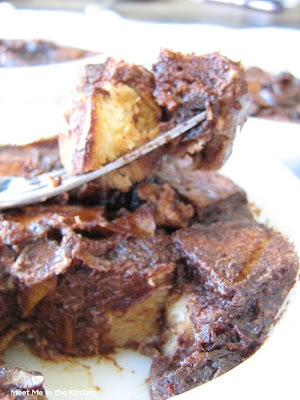 Combine powdered sugar and juice, stirring with a whisk; drizzle over warm bread. Cool bread completely on wire rack. 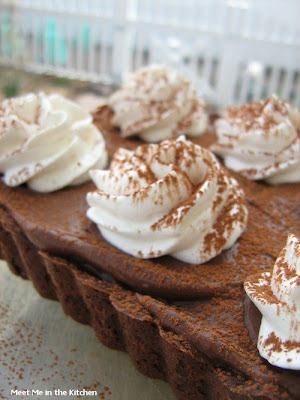 This weeks Tuesday's with Dorie selection- Chocolate Cream Tart, was chosen by Kim of Scrumptious Photography. You can find the recipe on her blog and most likely the calorie information for the tart as well, which I discourage you from looking at (jk). Sometimes it is better not to know. You will also find just what you might expect- scrumptious photos of this tart and many other goodies. This recipe is very straightforward. 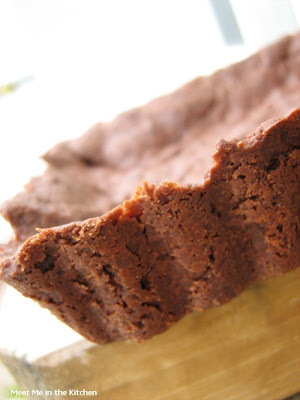 You make a chocolate tart crust and fill it with chocolate pastry cream. 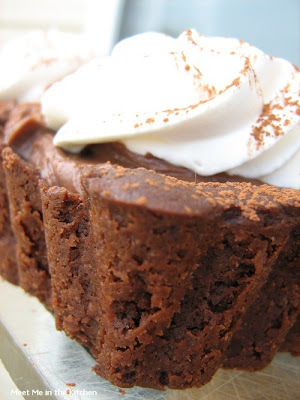 Then you whip some cream, sweetened with a little sugar (I added more than what was suggested because I like it a little bit sweeter than Dorie does), spread or pipe it on top, and sprinkle it with cocoa powder. Pretty basic. I stuck to Dorie's recipe and sent this tart off to the same work meeting as the lemon bars from yesterday. 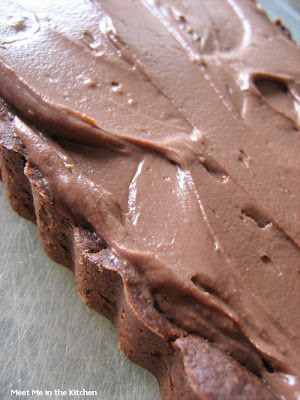 I have made the chocolate pastry cream before, so there weren't any surprises about how that was going to turn out. My tart shell didn't hold all the pastry cream, so I made extra whipped cream and some lucky members of my family got to have that for dessert (You are welcome, Jake!). This was also the first time that I used my new rectangular tart pan and I thought it turned out very nicely. I cut the tart into 16 pieces which will make me feel better for the people who ate it, once I look at the calorie count on Kim's blog. 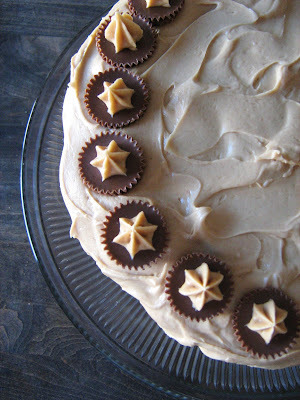 Actually, it really doesn't count as dessert if it isn't decadent. Right? 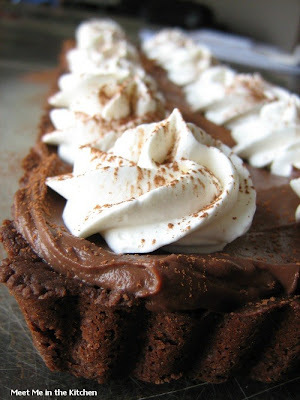 I am sure there are going to be some wonderful variations on this tart, so check out the TWD Blogroll to see what everyone else did with this very chocolately dessert! 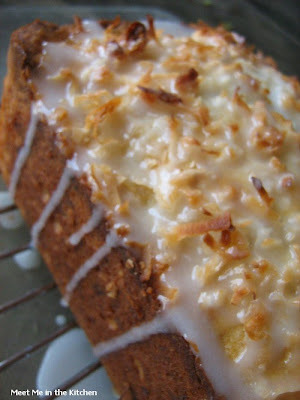 This month's Cookie Carnival cookie is Toasted Almond Lemon Bars, from The Sweet Melissa Baking Book. I just noticed a baking group-Sweet Melissa Sundays- that is baking it's way through this cookbook. I own this cookbook and it has some really great recipes. Back to the Cookie Carnival. This month we had our first ever guest host- Holly of Phemomenon. She chose these lemon bars and I know quite a few people who are glad that she did. 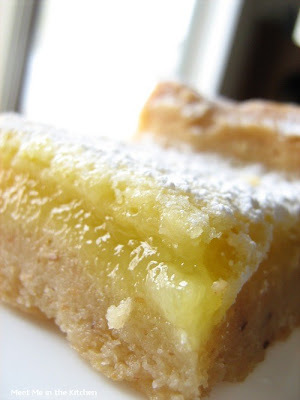 Lemon Bars were something I remember having as a kid and nothing is as good as a homemade lemon bar. (Meaning the ones from the box just don't cut it for me). I do have to admit that I gasped when I saw that the crust called for 2 1/2 sticks of butter. And that the recipe was only supposed to yield 12 squares. I wouldn't allow myself to do the math. I don't know why it was so shocking- it just seemed like a ton of butter. Luckily for me and my hips, I made these for a family members' work meeting and probably cut them into 36 squares, at least. I used sliced almonds, which I toasted and that gave the crust little flecks of almond that I thought was nice. The filling was nice and tart. It had quite a zing to it. The almond extract added something extra too, which was very delightful. I did have to try a tiny piece, as did my little helpers and everyone thought they were really good. The plate came back from the meeting empty, so I am pretty sure everyone enjoyed them. These are just how a lemon bar should be- thick crust, tart filling and a heavy sprinkling of powdered sugar. "Everyone loves lemon bars. 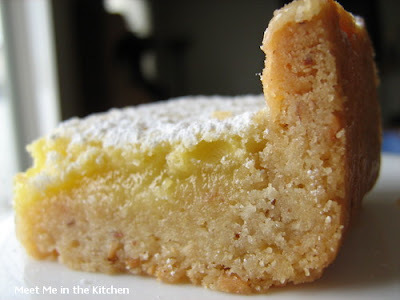 I make mine extra special by adding toasted almonds to the shortbread crust." Preheat the oven to 350 degrees F. Spread the almonds in a single layer on a cookie sheet. Bake for 10 to 12 minutes, or until lightly golden and you can smell them. Remove to a wire rack to cool. Position a rack in the center of your oven. Preheat the oven to 350 degrees F. Spray a 9 x 13 - inch pan with nonstick vegetable cooking spray. Make a parchment "sling" by cutting two pieces of parchment paper, measuring 16 1/2 inches long by 12 inches wide (you can also use aluminum foil). Place one piece across the length, and the other across the width of the pan, with the excess hanging over the edges. You will use this sling later to lift the finished bar from the pan. Spray the sling with the cooking spray. 2. Turn the dough out into the prepared pan and press evenly into the bottom and 1 1/4 inches up the sides. (This crust, once it is baked, needs to act as a liner in which to pour the liquidy lemon filling. So be sure to do a good job of pressing the dough up the sides - no cracks!). Cover the dough with a piece of parchment paper or aluminum foil, and fill with pie weights ( you can use dried beans or uncooked rice as pie weights as well). Bake for 25 to 30 minutes, or until lightly golden. Carefully remove the pie weights and the liner and bake for an additional 10 to 15 minutes, or until the whole crust is golden. Remove to a wire rack to cool. 2. When cool use the parchment sling to lift the entire bar from the pan and onto a cutting board. Slice into twelve 3 x 3 1/2 - inch bars. Remove from the pan and, using a small sifter, dust with the confectioners' sugar. This was a really quick lunch we had recently on a day off from school. I know Huevos Rancheros are supposed to be a breakfast dish, but, I made them for lunch and it worked out. 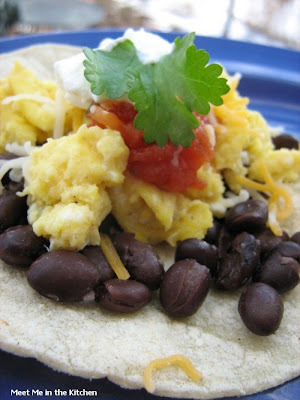 I also think that Huevos Rancheros traditionally calls for fried eggs, but I am not an expert, so I don't know for sure. I am not calling this an authentic dish, so feel free to correct me if I am wrong. I am just using the recipe title that was in the magazine. I served them at the wrong time of day and made them untraditionally, but they were still good. This is a quick meal and it starts out with a really fast blender salsa. You cook everything in the same pan, so there aren't alot of dishes to worry about. I added some cumin and chili powder to the black beans, just so we could have a tad bit more flavor. 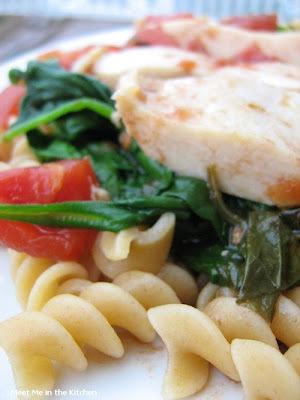 This recipe was really fast and I could see it fitting easily into our favorite meals. I like eggs and beans. They are pretty basic and this is a fun way to get them into your diet. So, if you have a few minutes, try serving these for breakfast, or lunch, or really, whenever you want. 1. Using a food processor, pulse together the tomatoes, onion, cilantro and jalapeño until chunky. 2. Coat a large skillet with cooking spray and heat over medium-high heat. Add the eggs, season with salt and pepper and scramble for 3 to 4 minutes. Transfer to a large plate. 3. Wipe out the skillet, add the beans and 2 tablespoons water and cook over medium heat until warmed through; transfer to a bowl. Wipe out the skillet, add the salsa, season with salt and cook for 5 minutes. 4. 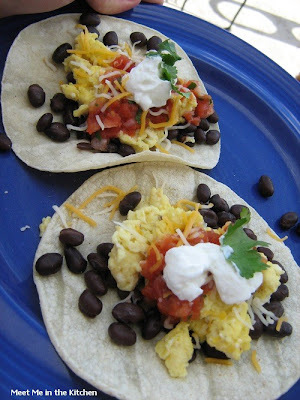 Divide the tortillas among 4 plates and top with the beans, eggs, salsa, cheese, sour cream and cilantro. 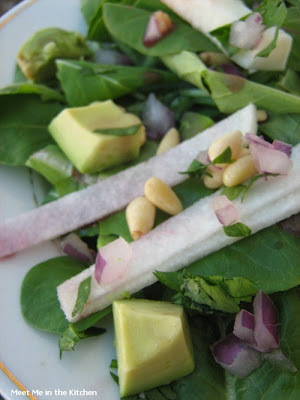 Here is a quick, fresh salad that I wanted to try even though pomegranates aren't in season right now. I still had some of the POM Wonderful juice that I received in the mail and used that in the dressing. Because of that, I omitted the pomegranate arils and made a few other substitutions as well. This was a fun salad, with lots of different flavors and textures. The fact that you can find POM juice in the grocery store, makes this salad accessible all year round. so give it a try! I saw this recipe in a recent issue of Cooking Light. This was one of the category finalists for the family dinners section of their recipe contest. 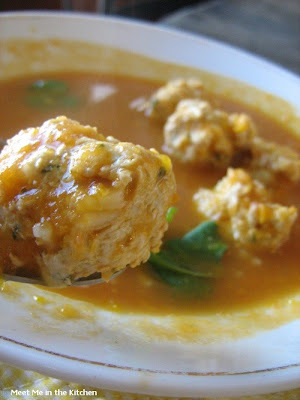 I have seen other recipes for Albondigas and thought that they sounded really interesting, but I really loved the amount of vegetables that were in this particular recipe. I changed a couple of things like using fresh bell peppers instead of frozen and using only chicken broth, instead of some chicken and some beef. I also just used a regular onion instead of a sweet onion becauce that is what I had on hand. This dinner did take awhile to put together, but it got alot of raves and made such a large amount that we had 2 meals worth of leftovers. My kids loved the meatballs and even the other adults thought the soup had great flavor and wanted to eat it warmed up later. We really liked this and I can see why it was one of the finalists in the contest. 1. Heat oil in a large Dutch oven over medium-high heat. Add pepper stir-fry to pan; cook 5 minutes, stirring occasionally. Add carrot; sauté 5 minutes. Stir in tomatoes, chiles, and broths; bring to a boil. Reduce heat, and simmer 15 minutes or until carrot is tender. 2. Place one-third of broth mixture in a blender. Remove center piece of blender lid (to allow steam to escape); secure lid on blender. Place a clean towel over opening in blender lid (to avoid splatters). Blend until smooth. Pour into a large bowl. Repeat procedure with remaining broth mixture. Return to pan. 3. Combine chicken, pork, squash, cilantro, 1/4 cup rice, onion, 1/2 teaspoon salt, 1/2 teaspoon black pepper, and egg in a food processor; process 30 seconds or until blended. Bring broth mixture to a boil. Drop meat mixture by rounded tablespoonfuls (about 45 meatballs) into broth mixture. Add remaining 1/2 cup rice to pan; reduce heat, and simmer 45 minutes or until meatballs are done. Stir in remaining 1/2 teaspoon salt and 1/2 teaspoon black pepper. Stir in juice. If you are here looking for Barefoot Bloggers, sorry. I had to quit a couple of groups because I was in a little over my head and I am trying to organize my family for an across the country move in a little over a month. I have loved being a part of BB, but I had to let it go. 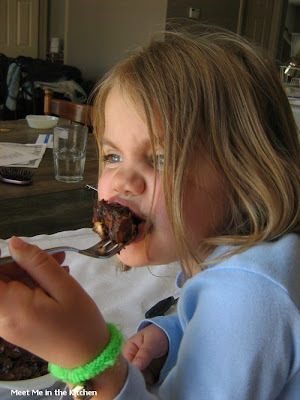 If you are here for Craving Ellie in my Belly- then keep on reading. I am going to keep it short. 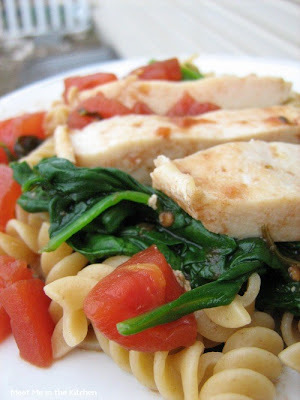 This week's recipe- Balsamic Chicken with Baby Spinach and Couscous was chosen by Marthe of Culinary Delights. I threw this meal together on a weekend when we needed dinner fast and I mean, it was fast. I served it with whole wheat pasta instead of couscous because that is what I had in my pantry and it worked. There wasn't anything super or amazing about this meal, but it was good and everyone ate it. It was quick and easy, so that was a plus. To see what the other Ellies thought check out the Blogroll! Heat a large saute pan over medium-high heat. Add the olive oil and heat. Add the garlic and cook for 1 minute. Add the chicken and cook about 4 minutes per side, or until cooked through and juices run clear. Remove the chicken and set aside. To the same pan, add the spinach and cook just until wilted, about 1 to 2 minutes. Remove from the pan and set aside. Lower the heat to medium and add the balsamic vinegar and chicken broth to the pan and stir, scraping the bottom of the pan to remove any browned bits. Add the tomatoes, bring to a simmer and cook 3 to 5 minutes. I am not sure why we dyed so many eggs for Easter. My kids just get so excited about the colors and the eggs seem to go to fast. Of course we used the hard-boiled eggs for the usual things that we love- Egg Salad Sandwiches and Deviled Eggs, but I didn't take pictures because I have posted about both of those before (last year). I was looking for a different recipe that would use a couple of the eggs. I remembered this recipe from the April issue of Everyday with Rachel Ray and asparagus has been very affordable lately, so I decided this was the next thing I was going to try. This recipe is really easy. I had everything on hand and it was ready in a matter of minutes. 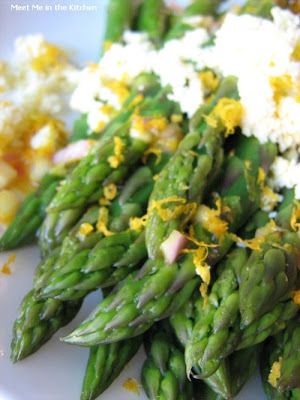 You just press the eggs through a sieve and place them on top of the asparagus which is drizzled with the vinaigrette. It turned out great and made for a nice side dish. 1. In a large, deep skillet, add enough salted water to reach a depth of 2 inches; bring to a boil. 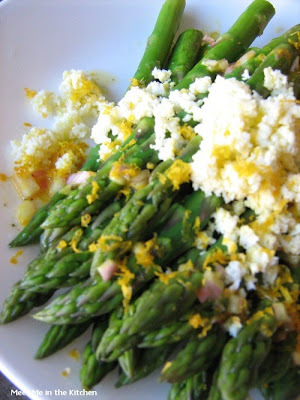 Add the asparagus and cook until crisp-tender, about 3 minutes. Transfer to a bowl of ice water and let stand until chilled. Drain and pat dry. 2. In a small bowl, whisk together the apple cider vinegar, shallot, mustard, tarragon and orange peel. Slowly whisk in the olive oil until combined; season with salt and pepper. 3. Cut the hard-boiled eggs in half, then press through a sieve into a small bowl. 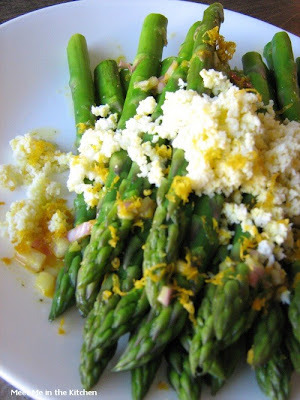 Toss the asparagus with some of the vinaigrette. To serve, drizzle with more dressing and top with the eggs. 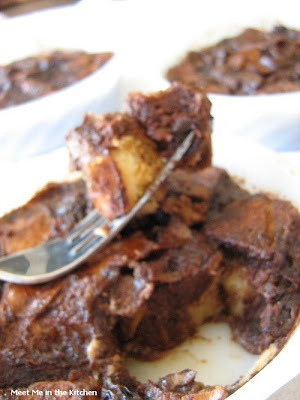 This week's Tuesday's with Dorie recipe, 4- Star Chocolate Bread Pudding, was chosen by Lauren. 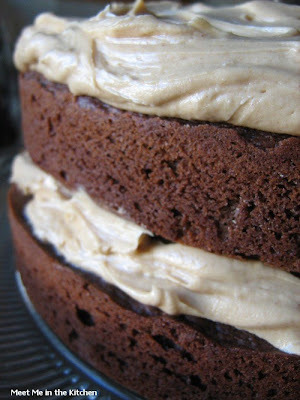 You can find the recipe on her blog- Upper East Side Chronicle. I have to admit that this was one of the recipes that was on my list of things I wanted to choose when it was my turn to pick the recipe. 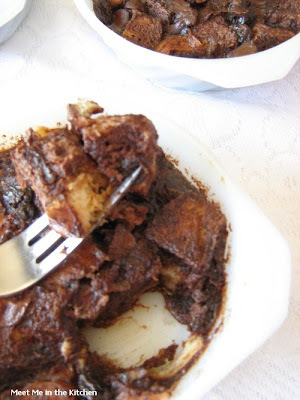 I made bread pudding last year for the first time because I found an interesting recipe in a magazine and we all really liked it. Except my husband thought the name sounded gross, so we called it French Toast Pie instead. Anyway, I knew that I was going to like this recipe. I used challah bread and made 1/2 of the recipe. My bread was stale, but I toasted it anyway, to make it crisp and ready to soak up the yummy custard. I ended up using 2 eggs in the custard because I didn't feel like halving an egg. I also used skim milk because that is what I had in the fridge and used a little bit extra heavy cream to thicken it up. I thought this recipe was super easy. I made it in 5 little ramekins. I liked the chocolate in the custard. I sprinkled raisins on top of some of them and chocolate chips on top of the others. I sprinkled raisins and chocolate chips on one. Daring, I know. This definitely isn't a pretty dish and it isn't very photogenic, but it tastes good and that is what really matters. My daughter digged into one warm. I thought they tasted better cold. I didn't serve them with any topping or anything else. Delicious. Go check out the TWD Blogroll to see if everyone else loved it as much as we did! I saw this recipe in the newspaper and was intrigued by the combination of falafel and red curry paste. I have recently been trying lots of different curries and recipes that include red and green curry paste. I really like the flavors and thought this would be another great recipe. I was right. This was so delicious! 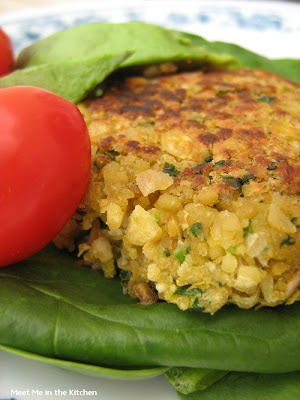 The only problem that I had with this recipe was that the falafel patties were very fragile and I had trouble keeping them in patty-form. I don't know if this is because I didn't want to overprocess the mixture in the food processor (there was a warning about doing so in the article-which I included with the recipe below) or just something else. I replaced the flatbread that the falafel was supposed to be served on and instead served the patties on spinach with the tomato and avocado garnish on top. 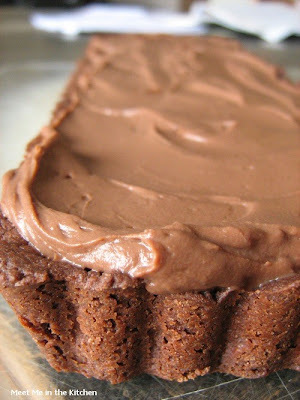 I am going to make these again because they were soo good, fast and easy! them on the grill. Very good." Thai red curry paste, a spicy staple of many Thai recipes, lends gentle oomph to this rethinking of falafel (fritters made from chopped chickpeas and herbs). Jars of curry paste can be found in the ethnic food aisle of most large grocers. These Middle Eastern fritters traditionally are served with a yogurt sauce, which cuts some of the heat. This version uses thick slices of avocado instead. The fat in the avocado plays the same cooling role as the yogurt. A food processor makes easy work of this recipe, but be careful not to over-process the chickpeas. Process for too long and you'll end up with hummus (though it probably will be delicious). And don't be intimidated by the spicy factor. The "heat" of Thai red curry paste is more akin to a vinegary bite than to a hot pepper burn. In a food processor, combine the red curry paste, cilantro, parsley, cumin, salt, pepper, bread and lemon zest. Pulse until the bread is chopped to mostly fine crumbs. Add the chickpeas and pulse until the chickpeas are well-chopped. Form the mixture into 9 patties, using about 1/4 cup of the mixture for each. In a large skillet over medium, heat 1 tablespoon of the canola oil. Fry half of the patties until the bottoms are lightly browned, about 1 to 2 minutes. 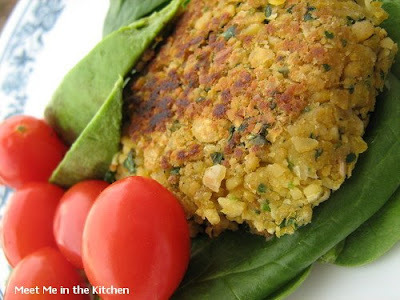 Use a spatula to carefully flip the falafel and brown on the other sides, about another 1 to 2 minutes. This recipe caught my eye recently in a Southern Living Magazine. 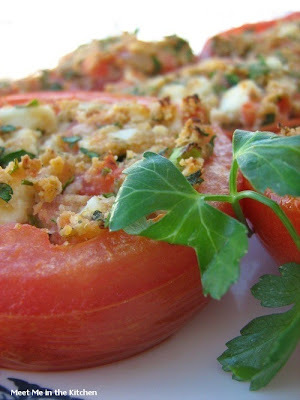 I love tomatoes and feta and fresh herbs and I just thought this recipe looked really fresh and delicious. We had it on the side with dinner and everyone really enjoyed it. 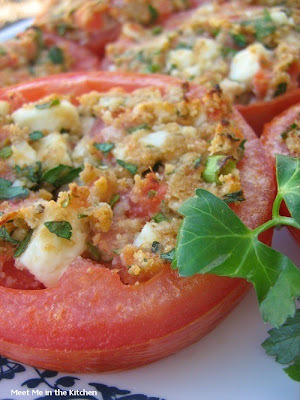 I think the most important thing for this recipe is to make sure you use ripe and flavorful tomatoes. Since they are the star of the star here, they have to be good. I hope everyone has a great weekend. My husband flew in late last night for a quick weekend visit, so I am making this short and sweet! Prep: 15 min., Bake: 15 min. Cut 4 large tomatoes in half horizontally. Scoop out pulp from each tomato half, leaving shells intact; discard seeds and coarsely chop pulp. Stir together pulp; 4 ounces crumbled feta cheese; 1/4 cup fine, dry breadcrumbs; 2 tablespoons chopped green onions; 2 tablespoons chopped fresh parsley; and 2 tablespoons olive oil in a medium bowl. 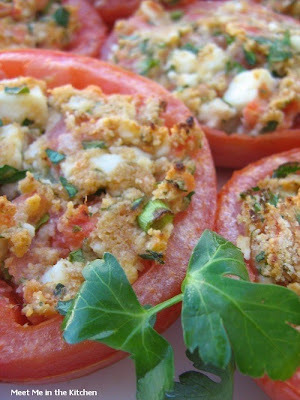 Spoon mixture evenly into tomato shells, and place in a 13- x 9-inch baking dish. (I sprayed the dish with cooking spray). Bake at 350° for 15 minutes. Garnish with Italian parsley sprigs, if desired. 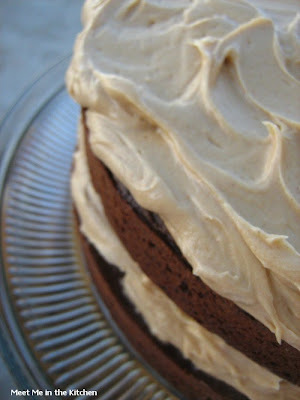 What happens when a delicious chocolate cake by Dorie Greenspan meets some creamy PB frosting from the Barefoot Contessa? Magic. 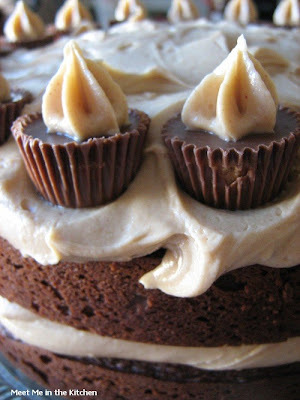 You have probably seen some version of this cake floating around on the internet or food blogs. And there is a reason why. It is amazing. I first saw it on Tara's blog- Smells Like Home and then read on her blog that she found it over at Slow Like Honey. I was making a couple of cakes for an event and already had a lemony one and a pumpkin one, so I figured the only thing missing was chocolate. 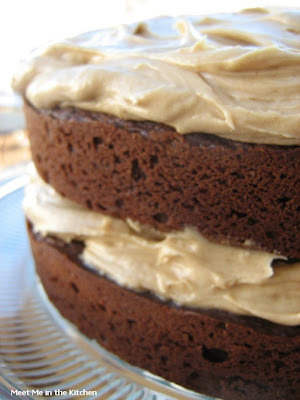 I picked this recipe because I knew it was delicious and sometimes it is nice to be able to whip up a cake that you have already tasted before, so you know that it will be a success. Don't get me wrong, I love trying new things, but every once in awhile, I make the same thing twice. Especially when it is this good. I have had multiple requests for the recipe and I am sure if you try it and have the heart to share, you will too. Enjoy! 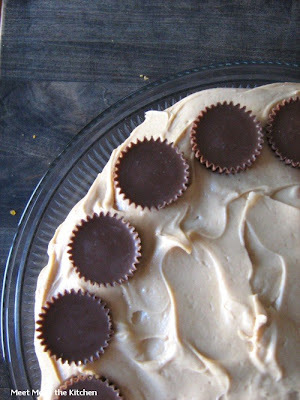 Countless amounts of miniature Reese’s peanut butter cups, smashed or cut up. Getting Ready to Bake: Center a rack in the oven and preheat the oven to 350 degrees F. Butter two 9-x-2-inch round cake pans, dust the insides with flour, tap out the excess and line the bottoms with rounds of parchment or wax paper. Put the pans on a baking sheet.